Quebec physicians are baffled by an outbreak of the dancing plague, a rare disease with no known cure, struck several regions across the province. Thousands of Quebeckers have taken to the streets to dance, and many of them are incapable of stopping. “We’re worried that this is a repeat of the great dancing plague of 1518,” says Dr. Rael Porvrai. 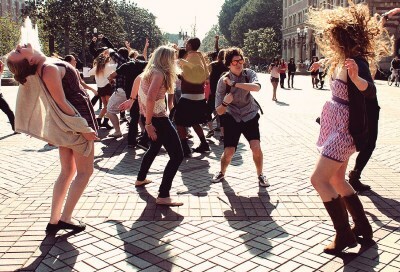 “In that epidemic, 400 people in Strasbourg took to the streets to dance. It lasted for weeks. Many citizens died from exhaustion, others from heart attacks. They literally danced themselves to death." Quebec’s dancing plague might dwarf the original of 1518. “Today, over a thousand Quebeckers are already suffering from dancing fever,” says Dr. Porvrai. “If the disease continues spreading, we believe that ten thousand people will be dancing in the streets by the end of the month. After that, we’re looking at an apocalyptic dancing scenario. It’ll be like walking dead, but with more dancing and EDM." Gaetan Botine, Quebec’s Health Minister, is working with experts around the world to help study and understand the bizarre danciang outbreak. “We need to know why people are dancing uncontrollably,” says Gaetan. “Is it an airborne virus that’s making them dance? Is it bacterial? Is it just because it’s the summer and it’s beautiful outside and life is pretty great? It’s a mystery, and we’re going to solve it or die trying." Gaetan says that Quebeckers who have the urge to dance should be careful. “If you find yourself dancing and don’t know how to stop, make sure to call 911,” says Gaetan. "They’ll help you get the treatment you need. Dancing is fun in moderation, but the dancing plague takes it to an unhealthy extreme."